Take a ride on Pacific Coast Highway and catch this view, but don't look down. 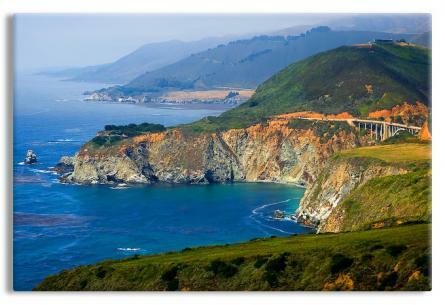 Big Sur is a remote region of the central California coast where the Santa Lucia Mountains rise abruptly from the Pacific Ocean. The terrain offers stunning views, making Big Sur a popular tourist destination. Big Sur's Cone Peak is the highest coastal mountain in the contiguous 48 states, ascending nearly a mile (5,155 feet) above sea level, only three miles ) from the ocean.